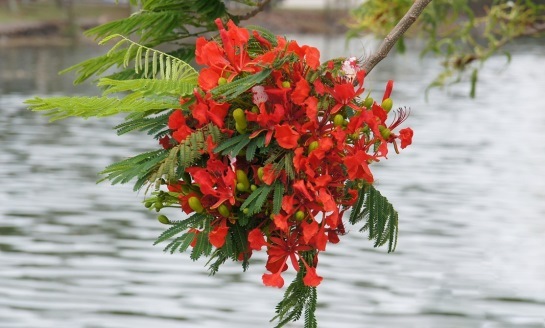 This will be our last e-newsletter for the year. With Christmas fast approaching, we are planning a short closure period from 21 December - 10 January, but until then are happy to share with you some of our latest news. We're excited to share this month that Gab Titui was shortlisted for a Museum & Gallery Achievement Award for our cultural maintenance exhibition Evolution: Torres Strait Masks. Our Gallery Officer, Aven Noah Jr, was also selected to participate in the NGA Indigenous Arts Leadership Program during November. Our 2016 calendar continues to sell well - congratulations to all of the artists featured. Don't miss out on getting your copy before Christmas for only $10! From all the staff at Gab Titui, thank you to all the artists, visitors and others for your continued support in 2015. We wish you all a happy and safe holiday season and look forward to seeing you in the New Year. We're happy to share that Gab Titui was recently named a finalist in the 2015 Queensland Gallery & Museum Achievement Awards! The Awards are presented by Museums & Galleries Queensland to recognise the important role and contributions of individuals and organisations to the gallery and museum sector. Gab Titui was shortlisted for our current cultural maintenance exhibition, Evolution: Torres Strait Masks alongside three other organisations including the Museum of Brisbane. 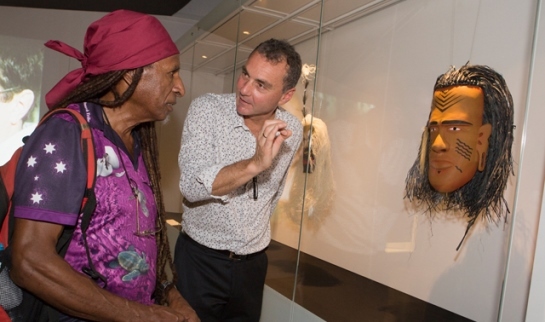 Since opening on 18 June Evolution: Torres Strait Masks has attracted over 6500 visitors, including Dr Mathew Trinca, Director of the National Museum of Australia (pictured above) and the former Prime Minister of Australia, Tony Abbott. The aim of Evolution: Torres Strait Masks was to highlight the continuing importance of these masks, their evolution from the past and influence on present day contemporary art forms. Masks are representational of ancestral, supernatural and/or totemic beings that form an important component in the traditional beliefs of Torres Strait Islanders. The exhibition takes the viewer on a journey from time immemorial when masks were used in ceremonial rituals involving art, theatre and dance. It tells of how these historic artefacts, now kept in national and international institutions, have inspired new works and how these are constantly developing and changing. Irrespective of the impact of cultural desecration that post-colonialism had caused in the Torres Strait, the art of creating masks and choreographing new dances is part of a continuing cultural tradition. 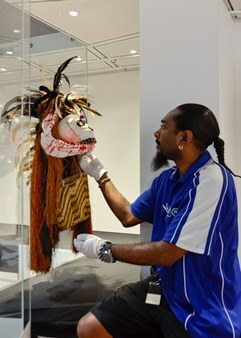 Evolution: Torres Strait Masks was curated by the Gab Titui Operations and Exhibitions Manager and Gallery Officer, with the invaluable support of award-winning Badu artist, Alick Tipoti. Congratulations to the seven artists who created contemporary masks for the display and to everyone who was involved in the creation of our great exhibition! Read more in our media release. Evolution: Torres Strait Masks is on display now in Gab Titui's Ephraim Bani Gallery. Buy your copy of the catalogue in store for only $15.60. Photo: National Museum of Australia Director, Dr Mathew Trinca (R) and Andrew Passi Snr (L) with his mask Sor Kobir 2. Photography by George Serras, National Museum of Australia. Congratulations to our Gallery Officer, Aven Noah Jr, who has recently completed the National Gallery of Australia Indigenous Arts Leadership course in Canberra. Aven was selected as one of only ten participants from across Australia for the industry-focussed program, designed to inspire, build knowledge and create lasting networks. The program takes participants behind the scenes at the National Gallery to demonstrate the different types of jobs, roles and careers that are available in the visual arts sector, with the aim of supporting Torres Strait Islander and Aboriginal arts workers into leadership and decision-making positions within the industry. Aven is the third Gab Titui staff member to participate in the course and benefit from the knowledge of industry professionals and the experiences of other arts workers from around the country. Read more in our media release or visit nga.gov.au/IndigenousLeaders to find out more about the NGA Indigenous Arts Leadership program. Main image: Gab Titui Gallery Officer, Aven Noah Jr. Inset: Aven Noah Jr with Naga Mawa by Yessie Mosby during the installation of Evolution: Torres Strait Masks. Photography by Christina Tully. 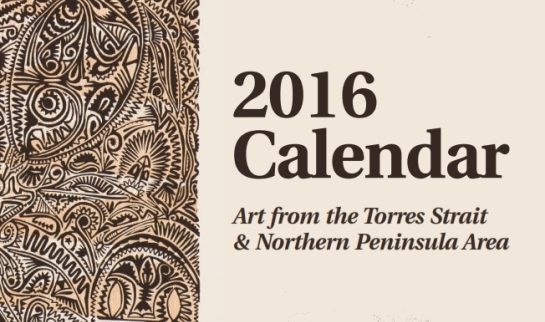 Buy your copy of the 2016 Art from the Torres Strait and Northern Peninsula Area calendar in store now for only $10! 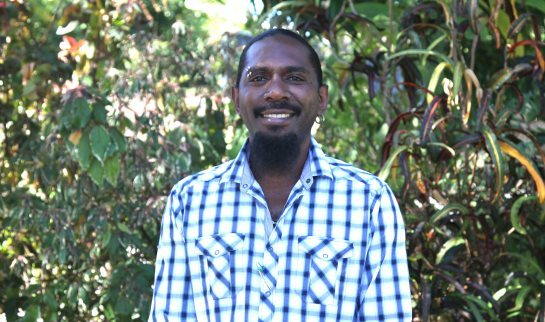 The calendar features the works of 12 local artists, from communities including Mer in the eastern Torres Strait to Saibai in the north and Badu in the west. At only $10 the 2016 calendar makes a great Christmas present for family and friends. Buy in store today, over the phone or by email. Postage available - flat rate $5 nationwide. Call us on 07 4069 0888 or order via email. Calendar dimensions: 260x260mm, matte finish. Cover artwork: Solomon Booth, Baidam Tulu (detail) 2011. Linocut and woodblock on paper. 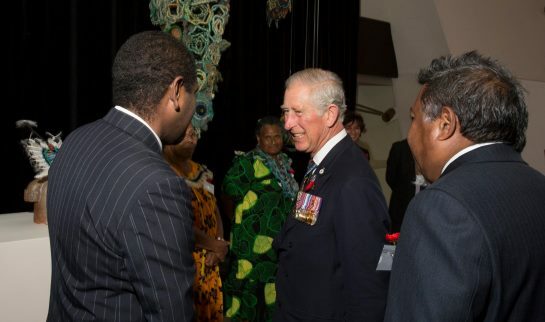 Congratulations to Erub Arts who travelled to Canberra recently to meet His Royal Highness the Prince of Wales at the National Museum of Australia. Erub Arts are among the Aboriginal and Torres Strait Islander artists featuring in the Encounters exhibition at the National Museum of Australia, who met The Prince of Wales alongside VIP guests and members of the public at an exclusive preview last month. For more information visit nma.gov.au/exhibitions/encounters or Erub Arts' on Facebook. Photo: Erub Arts' Jimmy Thaiday with The Prince of Wales and Peter Yu, Chair of the National Museum of Australia Indigenous Reference Group. Photography by George Serras, National Museum of Australia. Entries are now open in the 2016 Gab Titui Indigenous Art Award. The 2016 Award promises to be bigger and better than ever, opening on June 16 in Gab Titui's Wabunaw Geth Gallery. 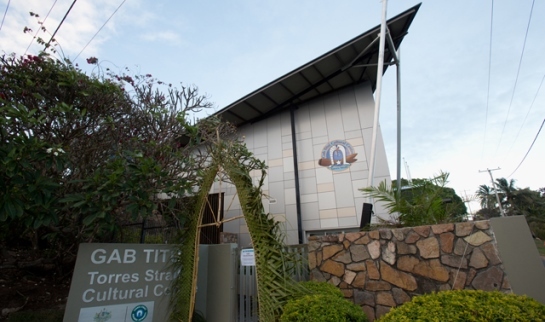 Torres Strait Islander and Aboriginal artists living in the Torres Strait and Northern Peninsula Area are invited to submit entries in the Award, for the chance to share in a total prize pool worth over $16,000. Now in its ninth consecutive year, the Award continues to offer artists, both emerging and established, the opportunity to share works with visitors, which in the past have included some of Australia's leading arts institutions and dignitaries. All works entered will also be professionally photographed and published in the exhibition catalogue, which is distributed nationally. The 2016 Award will be judged by Bruce McLean, Curator of Indigenous Australian Art at the Queensland Art Gallery | Gallery of Modern Art in Brisbane. For more information refer to our website, the 2016 Gab Titui Indigenous Art Award Information Booklet or call us on 07 40 690 888. 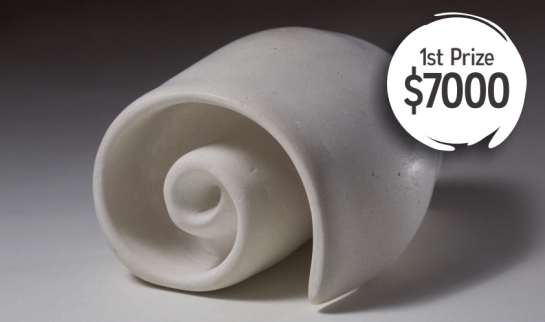 Entries in the 2016 Gab Titui Indigenous Art Award close 25 March 2015. Photo: Tony Matasia, Alup (Bailer Shell) 2015. Photography by George Serras, National Museum of Australia. We will be closing for a short Christmas and New Year break from 21 December 2015 until 10 January 2016. Drop in until 21 December from 10am - 3pm for all of your Christmas gift needs. We will reopen on Monday 11 January from 10am - 3pm. Our summer trading hours are 10am - 3pm, Monday to Saturday. Photo: George Serras, National Museum of Australia. Are you a Musician or Songwriter? APRA AMCOS is a national representative body for songwriters, composers and music publishers. They liaise with organisations to make your music available to the public and make sure that you get paid when the music you write is used. APRA AMCOS also has an ATSI Music Office specifically for songwriters and composers of Aboriginal and Torres Strait Islander heritage. For more information contact Michael Hutchings on 1800 642 634 or visit apraamcos.com.au/music-creators/atsi-music-office/. The 2016 Gab Titui Indigenous Art Award has been developed in line with the Code of Practice for the Professional Australian Visual Arts, Crafts and Design Sector. The Code sets out national best practice standards for the visual arts sector and is a useful guide for artists to help in understanding the practical and ethical guidelines for the conduct of business between artists, galleries and others. For more information contact the National Association for the Visual Arts or visit visualarts.net.au/code-of-practice/. Applications in the 2016 Gab Titui Indigenous Art Award close 25 March 2016. Copyright © 2015 Gab Titui. All rights reserved.